It’s okay to be sick. I find many folks don’t give themselves permission to be sick. They heap guilt and “shoulds” on themselves like: I shouldn’t have had sugar, gluten, dairy. I should have gotten more sleep. I shouldn’t have packed my schedule so tight. And on and on. Sickness is natural when it is in its place. It stretches our immune system and gives it a chance to prove its value. When we don’t fight off or combat a sickness easily or we get every cold or flu that passes by, then there is an issue with our immune system. That’s when constitutional homeopathy can help bolster a body. 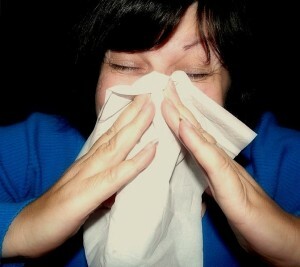 When a cold or flu gets “stuck” and won’t move forward, homeopathy can help jiggle it loose and move it toward cure. And, homeopathy can shorten a disorder once it is contracted. Homeopathy is great for helping folks strengthen their system (or “constitution”) so that they stay well more of the time. But that said, sometimes we just get sick and that’s okay. Seriously. But, if I am going to get sick, I usually go down swinging. We are running “Six ways to Sundays” in this culture and don’t listen to our body’s wisdom. We know when we need more sleep, water, and downtime. We just don’t listen. Practice tuning into your body. Do you need to go to bed earlier on a night after you’ve had a few busy days in a row? Do you need to take a few scheduled items off your calendar? Are you thirsty? Are you chilled? When we experience thirst it means we’re already down a quart in water! Did you know that we need to drink half as many pounds as we weigh in ounces? If you weigh 140 pounds you need to drink 70 ounces of water a day. Hydration helps flush germs through our system faster. Rest and sleep are key for allowing the body to heal. If we’re not tuning in to our body when a temperature shift occurs we don’t realize that we’re chilled until it is too late. While getting chilled can’t make you sick, it can help lower your resistance to a germ passing by. Wear more warm clothes than you think you need and peel off layers when you get too warm, but be careful not to strip down too fast and expose yourself to a chill. Unseasonably warm weather in fall/winter can open you up to a germ that hasn’t died from exposure to cold weather or a new strain that has come to the area and is multiplying because of the warmer weather. Similarly, a sudden cold snap can catch you unprepared. Wash your hands more, stay away from folks who are sick (if you can) and follow the other suggestions to stay well. In general we should all be eating a lot more fruits and vegetables (especially greens) and a lot less dairy, wheat and sugar. I could go on and on about this aspect of staying well, but I won’t for two reasons: others have written eloquently on the subject and we all live in modern dayAmerica. We don’t always have the time or inclination to eat perfectly. But, if your immune system is feeling compromised, cut back on the food items known to cause inflammation, mucus and to decrease immune strength: wheat and flour foods, dairy, and sugar. Increase fruits and vegetables, especially green veggies. Increase your water intake. A aspect of good hygiene that is not discussed in relation to a healthy immune system is dental hygiene. Infection and inflammation that may be present in cavities and periodontal disease make your immune system go on high alert. Whether or not you know that a dental problem exists, your immune system will start working hard to get rid of the problem. This in turn drains your available immune system energy. In addition, the pink moist ‘mucous membranes’ of your mouth are a direct highway into your bloodstream, so the infection – if there is one – can spread quickly to the rest of your body. It’s important to clean your teeth and gums properly on a daily basis to help your immune system stay strong. A multivitamin – I take one that contains B12 to help with stress. Vitamin C – As C is a water-soluble vitamin, the body will flush out excess amounts. It is safe to take several thousand milligrams a day. I take 2-4,000 mg a day. Vitamin D3 – Studies now show that we can take many thousands of IU a day. I take 2-4,000 IU a day. Probiotics – Get a product that has a lot of strains of good bacteria and that occur in a high quantity. Take 2-4 pills a day. Flax, Chia, or Fish Oil for Omega 3 Fatty Acids – take as directed. Cook soups with Astragalus which is a known immune booster in the herbal kingdom. Now let’s say you start feeling compromised. You’re tired, you’ve been pushing yourself too hard, and perhaps you’ve been around others with a cold or flu. You start to feel just a smidge chilled or achy. You may have a bit of headache and a touch of a scratchy throat. Act now! Follow this regimen and you may ward off the bugger! Cancel appointments and get more downtime. Eat less dairy, wheat and sugar. Make sure you’re warm. Wear a hat to keep your body heat in. You can increase Vitamin C to 1,000 mg an hour until you have a loose stool. This is called an ascorbic acid flush. Then you should cease the vitamin C intake until the next day and resume. You can increase Vitamin D3 to 1,000 IU an hour for up to 3 days. There are many different thoughts on how much D is too much, but one study I’ve read says this is safe. * Start taking an Echinacea and Goldenseal tincture like Source Naturals Wellness Formula. Take as directed. Increase probiotics with your pile of vitamins (4-6 pills twice a day). Take digestive enzymes on an empty stomach. These will eat the bacteria or virus germs in your gut. Salt is an amazing compound which has been used for thousands of years as a natural healing agent, a food preservative and even as currency. A fascinating book on the subject is “Salt: A World History” by Mark Kurlansky. Over the sink start to add warm water to the cup until you feel the temperature of the salt water is tolerable to gargle with. Gargle. Really tip your head back and make that fun gargling noise. Then when the cup is about half empty add warm water again until the temperature seems okay to snuff into your nostrils. Everyone who does this has their own method. Some use a nedi pot, others a ketchup bottle (I kid you not). I use a cup. Find a way to get the saline solution into your nose and then lean forward pinching your nostrils to allow the solution to get into your sinuses. This is an art you have to practice. Don’t drown yourself with the solution, just play with it until you get the hang of it. Do this 3-5 times a day. Believe you’re well. Instead of immediately saying, “I’m getting sick” or “oh know, I got the bug…” focus on being healthy. Listen to what you’re saying about your health. I don’t believe that we cause sickness by talking like we’re sick, but I do think that believing we’re healthy can help us stay healthy. You’d think as a homeopath I would have started here, but it’s important to me that we take responsibility for our health. Homeopathy is wonderful for so many things, but before we treat a cold or flu we can take steps on our own to avoid the sickness first. And, I believe that we can get over most colds and flu without homeopathy unless the sickness lingers or recurs frequently. If you are getting a cold or flu please call me. If the bug sticks around and you can’t move through it also call me. *These are suggested doses for adults, not for children or infants.